There are seven species of marine turtles. Six of these are found in the northern hemisphere. It is only the flatback that is restricted to the southern hemisphere. Each species has its own particular characteristics and behavior. 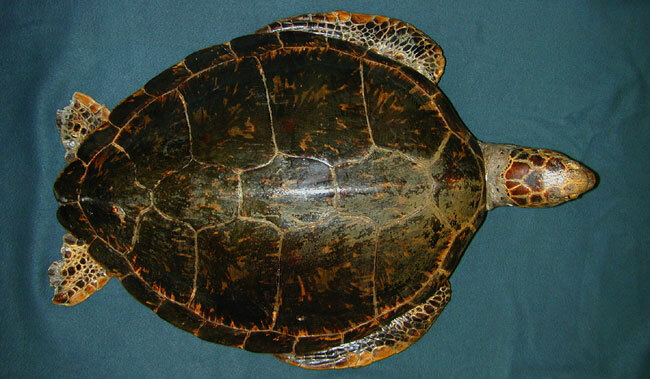 An eighth species is recognized by some as a subspecies of the green turtle, called the 'black turtle' or Chelonia agassizii (or Chelonia mydas agassizii), but this will not be treated in this lesson (except as a picture). Marine turtle sightings are not common on the West Coast of the United States although they do occur every few years. Many of these sightings are during exceptionally warm marine events (like at the end of a severe El Niño). Another time marine turtles are seen on the West Coast is when they may be sick, have gotten cold and/or stopped feeding. When turtles get cold they become lethargic and may stop feeding. When turtles stop feeding they become buoyant and then cannot swim down to get their food. This becomes a vicious cycle, with the cold and hungry turtles becoming weaker and weaker until they are unable to swim back to warm water. They are at the mercy of the currents. There have been marine turtle sightings all along the West Coast. 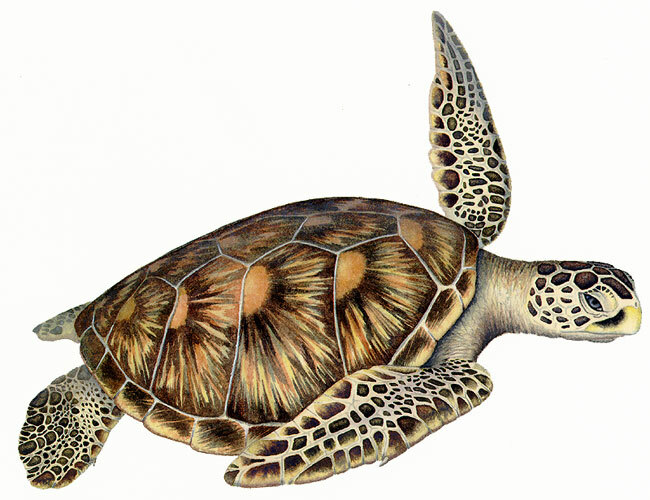 Marine turtles are common on the East Coast of the United States, especially in Florida. Many marine turtle nesting beaches are found in Florida. Much of the marine turtle research centers in Florida because of the proximity to marine turtle nesting areas. Marine turtles (especially green turtles) are common in Hawaii. Some Hawaiian beaches are known for the presence (almost daily) of green turtles. Hawaiians have been very protective of their turtles for many years with excellent educational programs and beach signs, informing their population as well as the tourists. On many Hawaiian beaches green turtles can be seen daily eating algae right next to snorkelers and swimmers. The marine turtles can be identified by several characteristics. The most common ones are the number of costal scutes per side, inframarginal scutes per side, and pairs of prefrontal scales. The costal scutes are on the carapace (top shell), along the side (but not on the bridge connecting the carapace to the plastron). The inframarginal scutes are on the plastron (bottom shell), along the side (again, not on the bridge connecting the carapace to the plastron). 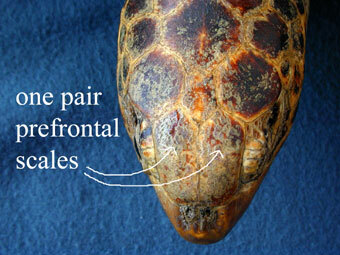 The prefrontal scales are the pairs of scales found above the eye of the turtle. 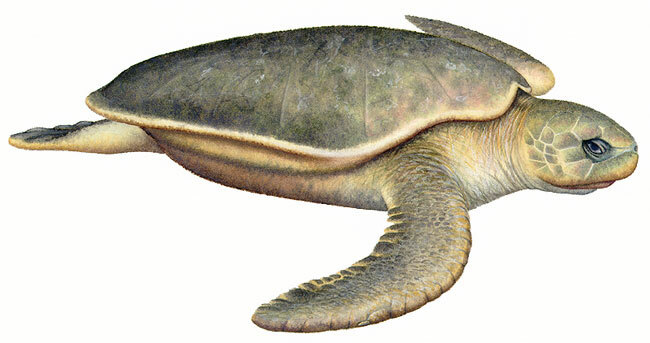 Kemp's (Atlantic) ridley marine turtles are carnivorous, feeding primarily on marine invertebrates. This species is thought to be the rarest of all the marine turtles, nesting only on one beach in Mexico (Rancho Nuevo). Other beaches were used historically but aggressive egg collecting is thought to have reduced this population to a dangerous level. All ridley turtles are 'mass nesters' where the nesting females come ashore together in one large group (called an arribada), usually in the day. This species is thought to nest annually (instead of waiting a year or two between nesting) and averages 105 eggs per nest. Baby Kemp's ridley turtles hatch at about 1.5 inches. Olive (Pacific) ridley marine turtles are omnivorous with a wide variety of food items. 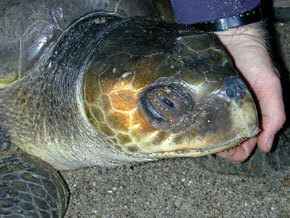 This species has mass nesting, with arribadas, like the Kemp's ridley but tends to nest at night. 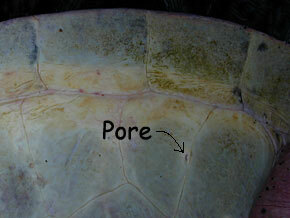 One of the main distinguishing characteristics of the ridleys is the presence of pores on the inframarginal scutes of their plastron. This species is found in the Atlantic and Indian Ocean as well as the Pacific Ocean. It is considered to be the most abundant sea turtle. Nesting female olive ridleys lay close to 110 eggs per nest. The babies are about 1.5 inches in diameter. 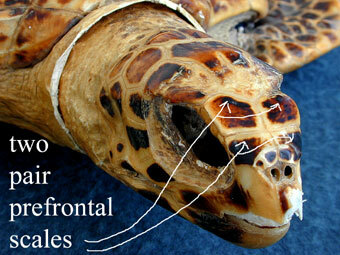 Hawksbill marine turtles are omnivorous and will eat almost anything. This is the turtle whose shell is coveted for use as "tortoiseshell." The shell has beautiful brown and beige colorations and polishes up to a fine gloss. Their carapace plates overlap each other in a distinct pattern unlike other marine turtles whose shells are quite smooth. Because of their valuable shell, many of these turtles are killed. They have a limited tropical range and rarely nest in large numbers so the status of their population is exceptionally hard to assess. 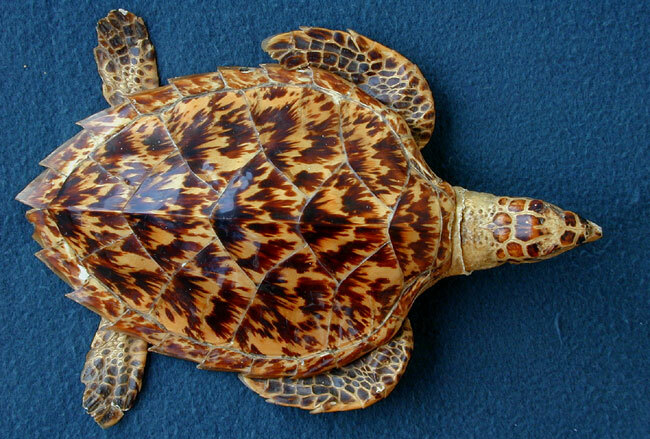 Most hawksbill females lay 160 eggs at a time. The babies are about 1.75 inches across. Flatback marine turtles are carnivorous, feeding mainly on sea cucumbers. 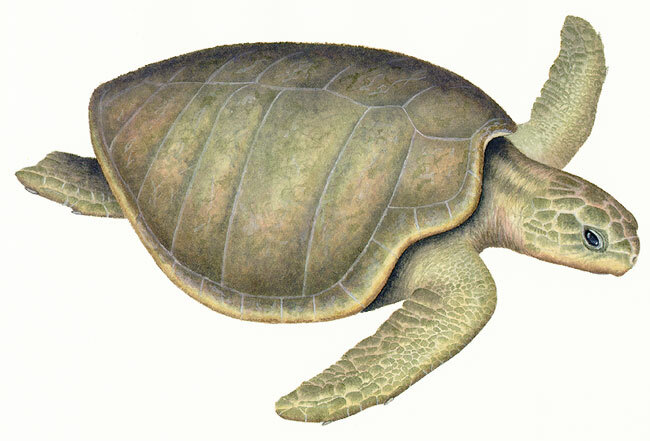 They are very similar to the green turtle, and used to be classified in the same genus (as Chelonia depressa), but now they are in their own genus (Natator). 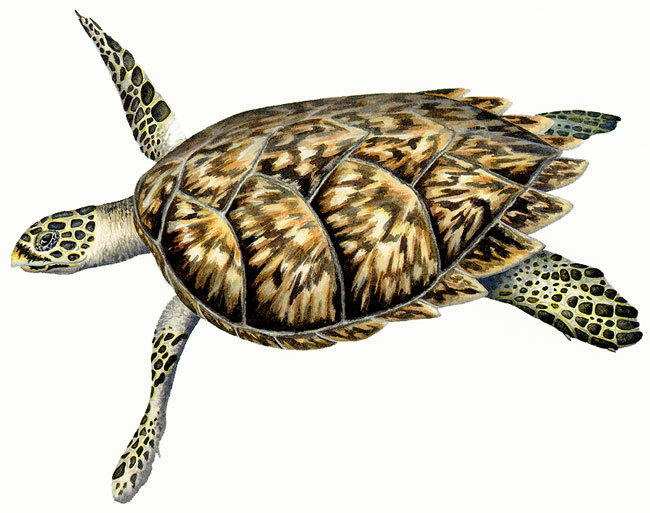 The flatback marine turtles are smaller than green marine turtles as adults. The babies however are larger than the green turtle babies at hatching (about 2 inches compared to a carapace length of 1.5 inches for green turtles). This species has one of the most limited ranges of all the sea turtles, nesting only in northern Australia. The beaches where they nest are very remote and rarely visited by people so it is thought that this population may be quite stable, with little influence by humans. They lay only about 50 eggs (instead of the usual 100). Green marine turtles are herbivorous as adults. They are named for the color of the fat under their skin (their shell is not necessarily green at all). It is the only adult marine turtle to be primarily a plant eater. This species is considered to have the most commercial value. Its body is used for food, its bone for fertilizer, its eggs for protein (and as an aphrodisiac). 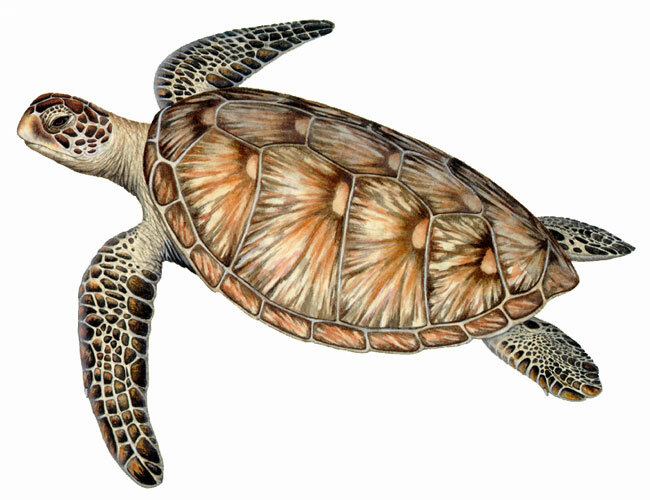 The shell of the green turtle is made into jewelry and its skin is used as leather. 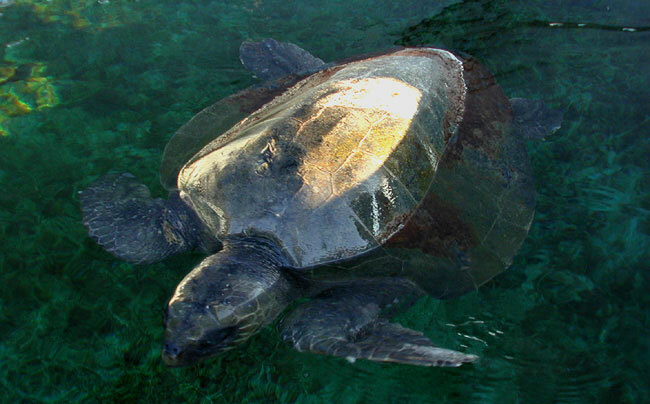 This turtle has nesting beaches all over the world in many tropical areas. In Hawaii the male green turtles often come out of the water to rest on the beach, an unusual behavior. Some people think that green turtles may be 50 years old before they reach sexual maturity and nest. 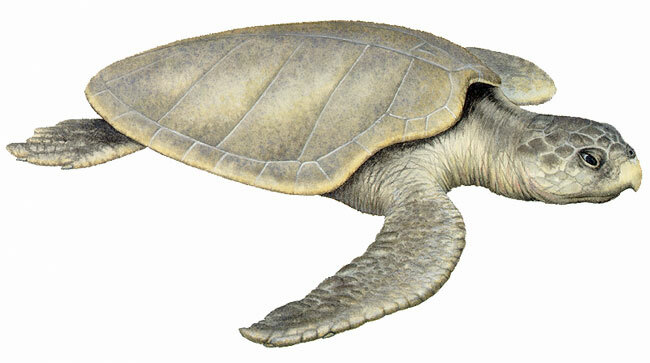 Female green turtles tend to lay around 115 eggs per nest. The hatchlings are about 1.5 inches across. 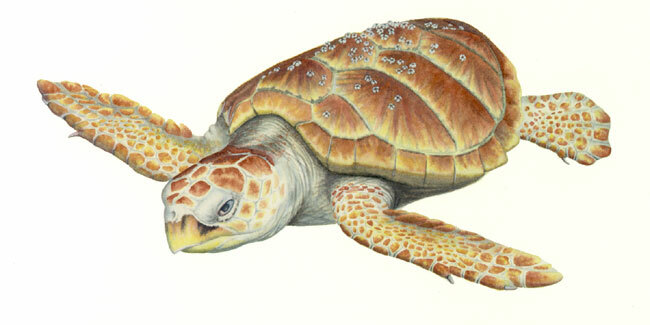 Loggerhead marine turtles are carnivorous, feeding on a variety of shellfish. Fishermen coined the name 'loggerhead' when they would see these turtles bobbing at the surface of the ocean, looking like floating logs. This turtle breeds on numerous United States beaches on the East Coast. Females lay between 100 and 120 eggs. The babies are 1.75 inches across. 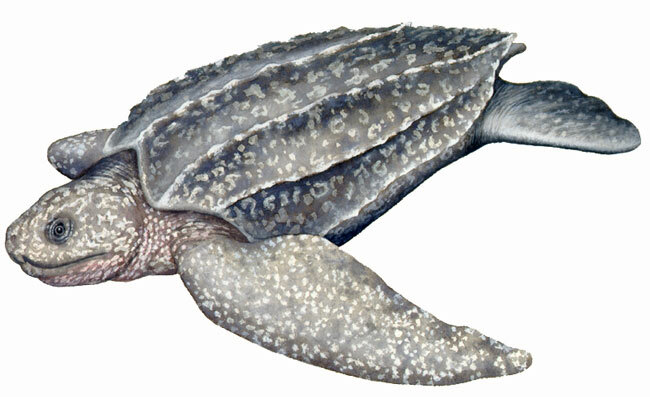 Leatherback marine turtles are carnivorous, feeding mostly on jellyfish (some bony fish too). This turtle is the only marine turtle to have two pointed notches on their upper beaks (possibly to help them hold on to the slippery jellyfish). They are the deepest diving marine turtle. This is the largest of the marine turtles (over eight feet across). The females generally lay about 80 eggs as well as another 30 smaller unfertilized eggs. The babies hatch when they are about 2 inches across. Leatherbacks have the widest range of any marine turtle. They are able to remain active in water that is as cold as forty degrees F. This is the only reptile known to still be active at this low temperature.